2018. The Gator women finished second in the team standings by a one-point margin. 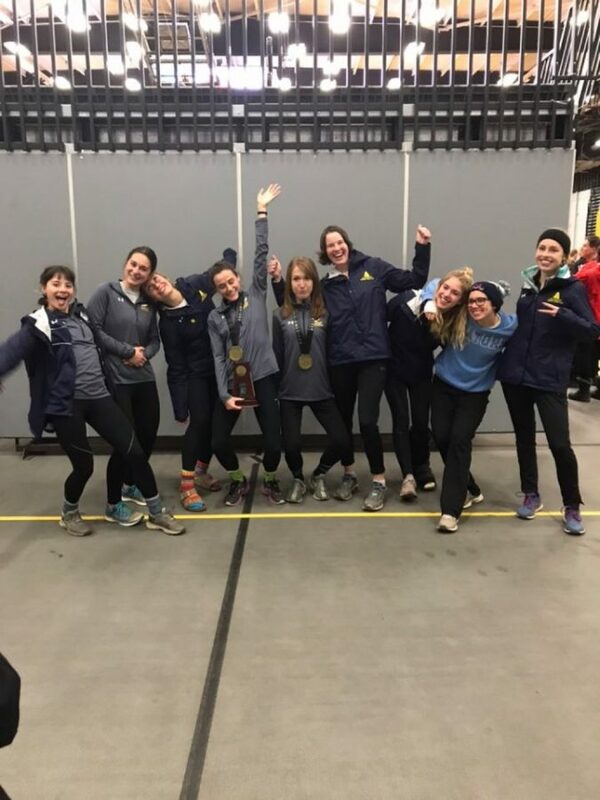 Allegheny Cross Country raced to the end of its season at the 2018 NCAA Division-III Championships Saturday, Nov. 17 in Oshkosh, Wisconsin. The Gator women raced as a team and finished 13th overall, with notable performances by Emily Forner, ’19, and Sarah Hevener, ’19. Both earned All-American honors, finishing eighth and 39th respectively. Forner’s 21:16.7 six-kilometer time was enough to place her 34 spots higher than her finish the previous year and 254 spots above her finish in the national meet her freshman year. Matt Svetz, ’19, ran as an individual for the men. He finished in 80th place in his second appearance at a national meet, finishing the eight-kilometer course in 25:28.7. He earned First Team All-NCAC honors for the second time in his career, having earned Second Team All-NCAC honors in his sophomore year. This national race was his third-ever trip and his second trip as an individual qualifier. Svetz has been building to his national performance with several career runs, including a 59th place finish at the 2017 NCAA Division-III National Cross Country Championship. The championship provided a strong conclusion to his junior season that included four top-ten finishes. Svetz built on this success with a strong senior season that opened with an individual and team victory in a dual meet against Chatham on Sept. 1, 2018. A fourth-place overall finish in the 2018 Allegheny Classic at the Robertson Athletic Complex helped to lead the Gators to a third-place team finish. A ninth-place finish at the Rowan University Inter-Regional Border Battle was followed by Svetz’s fourth 2018 top-ten finish at the 2018 Great Lakes Regional Championship Nov. 10, 2018. His time at the Regional Championship was sufficient to automatically qualify for the 2018 NCAA Division-III Championships and an example of the way in which Head Coach Ben Mourer, ’07, primes his athletes for the later season, according to Hevener. Mourer declined an interview. Hevener said this strategy does come with “trade-offs” as the team saves its better races by having a “good but average” early season. 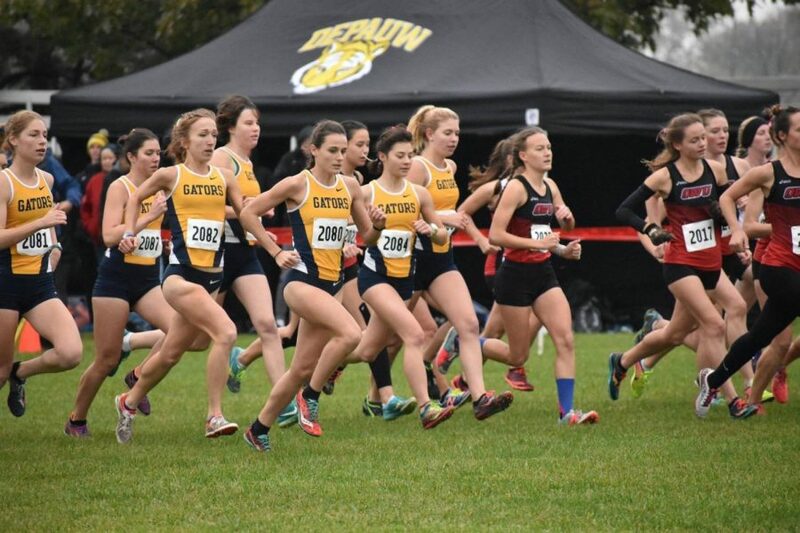 The lady Gators made their late-season improvement clear with a second-place finish at the 2018 North Coast Athletic Conference Cross Country Championship, losing to rival Oberlin College by one point. The margin was the slimmest since Allegheny topped Oberlin 59-58 in the 2007 NCAC Championship. “(The loss) was a little heartbreaking, but everyone did what they wanted to do, so that was big,” Gallavan said. Forner’s impressive showing in the 2018 season began before the Championships. Forner took gold alongside Svetz at the Chatham University dual-meet season opener, followed closely by teammates in third, fourth, fifth, sixth and seventh places. Forner went on to take first at the Allegheny Gator Classic and fifth at the Paul Short Run at Lehigh University — with a three-minute improvement over her time in the 2017 Short Run — in a field that included Division-I runners. It was her race at the Rowan University Inter-Regional Border Battle that hinted that she was bound for success, according to Forner. Her time at the Border Battle, her third victory out of the first four events of the season, helped to lead her team to an eighth-place finish. Forner took second in the Great Lakes Regional Championship held by Franklin College, earning All-Region honors for the third time. The Regional Race was Hevener and her teammates’ final race before the Division-III Championships. Forner said the team members rest their bodies between the two performances. in Oshkosh, Wisc. Saturday, Nov. 17, 2018. Hevener said the race is difficult to prepare for, particularly for younger team members who have never competed in this particular race. Forner said having experience as a senior helped her to appreciate her success at her final cross country race as a Gator. The conclusion of her career, according to Forner, was made even sweeter by teammate Hevener’s success. “It was incomprehensible, and then to also have my teammate and classmate Sarah Hevener also finish All-American and then to realize that that was the first time in school history that two ladies have finished All-American was just the perfect way to end our senior season,” Forner said. Hevener had a similarly impressive showing in the regular season leading up to the national race. She followed Forner’s victory in the Allegheny Gator Classic with a second-place finish and took 12th in a 362-runner field in the Paul Short Run. Her third-place finish in the NCAC Championship led Hevener to her third First Team All-NCAC cross country honors. An eighth-place finish at the Great Lakes Regional Championship made the lady Gators the only team with two top-ten finishers. Her 39th-place finish in the national race was 41 places higher than her 2017 finish. Hevener said the race was a chance for her and the team to display months of effort. “It’s like ‘okay, this is time to really show off all that work we’ve been putting in,’ ” Hevener said. Hevener and Forner led a young team that followed them closely in several in-season races and rounded out the overall score in the national race. Gallavan said the seniors offered their expertise to their teammates. 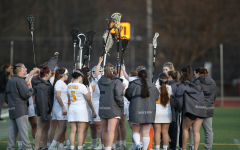 The Allegheny team is always particularly receptive to the messages offered by senior team members and coaches, according to Hevener. Mica Hanish, ’21, had a 22:09.3 time that earned her a 50th-place finish — 155 places higher than her rookie finish in the 2017 NCAA Division-III Championships. Hanish has earned All-NCAC honors in both of her seasons and earned her first All-Region honors at the Great Lakes Regional Championship. Sarah Lucas, ’21, and Molly Tarvin, ’22, took 186th and 233rd, scoring points for Allegheny in their first-ever appearance at nationals. Claire Morrison, ’21, and Jacelyn Roberts, ’20, also raced for the Gators. Forner said the team is capable of further improvements in future seasons. “They might not have been super satisfied with their first race, but hey, I finished 262nd my freshman year, the first time I raced there, so anything’s really possible, as far as getting better and improving,” Forner said. Hevener said the team is likely to bring a competitive edge, along with more experience, to next year’s race. “They had a little fun and were a little shocked, and are probably going to be back and stronger and hungrier next year,” Hevener said.